Supplies such as blankets, kitchen sets, jerry cans and shelter supplies are being sent to those most in need. 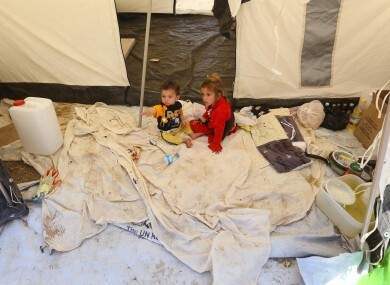 Iraqi children who have fled fighting between security forces and al-Qaida inspired militants in their hometown of Tal Afar carry sit in a tent at Germawa camp for displaced Iraqis. IRELAND IS TO dispatch urgently needed supplies to those that have been displaced by violence in Iraq. Supplies such as blankets, kitchen sets, jerry cans and shelter supplies are being sent to the country from the UN Humanitarian Response Depot in Dubai. The airlift, worth €220,000, will be distributed by Goal who received the funds from the Irish Government to provide the emergency relief. The supplies will go to those most in need in areas such as Ninewa Governorate in Northern Iraq. The violence we are witnessing has had devastating consequences for hundreds of thousands of already vulnerable children, women and men. The danger is that the impact on internally displaced people will increase over the coming weeks. He also announced that €75,000 is to be allocated to Christian Aid Ireland which will be used to procure food and essential non food items for internally displaced persons affected by the violence. Costello said he must again call upon all those involved in the current conflict to respect International Humanitarian Law to ensure that civilians are protected. Email “Ireland to send supplies to people of Iraq displaced by violence ”. Feedback on “Ireland to send supplies to people of Iraq displaced by violence ”.